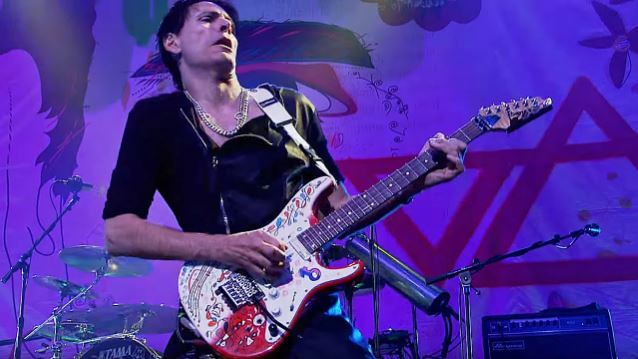 Guitarist and composer Steve Vai is among the inductees for this year's class of the Long Island Music Hall Of Fame. This year's class of inductees also includes legendary music executive Charles Koppelman, singer/songwriter Garland Jeffreys, film composer Carter Burwell, hip-hop performer Big Daddy Kane, legendary songwriters/instrumentalists Santo & Johnny, early jazz specialist/bandleader Vince Giordano, and Westbury Music Fair, now the NYCB Theater at Westbury. The LIMHOF will also present the 2016 Harry Chapin Award to Steven Van Zandt for his dedication to music education on Long Island and across the country. Additionally, LIMHOF honors the 2015 and 2016 Music Educators of Note — Long Island public or private school educators who have demonstrated an exceptional and long-term commitment to music education, as well as Long Island music students. All of the inductees were selected from LIMHOF's evolving and growing list of involved people, artists, groups and entities that were born, raised, were founded, or have resided on Long Island for a significant portion of their career or existence. "On behalf of myself and the entire Board of Directors of the Long Island Music Hall Of Fame, we are thrilled to have a new class of inductees join a long list of incredible people who have made their mark on the music industry," said Joe Jankowski, executive director of the Long Island Music Hall Of Fame. "This induction ceremony is set to be one of our best yet and as always, we have quite a few surprises up our sleeves." "I am very pleased that the Long Island Music Hall Of Fame has chosen The Space at Westbury for its prestigious induction ceremony. We look forward to hosting this extraordinary event," said Cyrus Hakakian, founder and owner of The Space at Westbury.